Purnendu "Sandy" Dasgupta, the Hamish Small Chair of Ion Analysis in UTA's Department of Chemistry and Biochemistry, has been named the 2018 Distinguished Texas Scientist by the Texas Academy of Science. Dasgupta also was recently named the recipient of the 2018 American Chemical Society's Division of Analytical Chemistry Chemical Instrumentation Award. 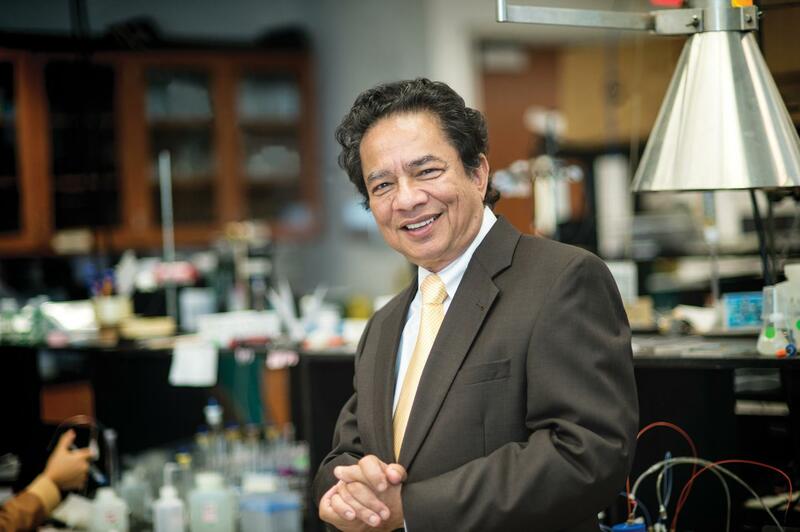 "Only elite scientists who have made significant international contributions in their fields are selected for these prestigious awards, and Dr. Dasgupta is truly among the greats," said Morteza Khaledi, dean of the UTA College of Science. "He not only challenges but also inspires his colleagues and students in our college and his research is applied science – it is improving public health on a global scale. I congratulate Dr. Dasgupta on yet another honor in his remarkable career." Dasgupta was previously named the recipient of the 2017 Talanta Medal, an international award in the field of analytical chemistry. The Talanta Medal will be presented in March. In January, one of his papers was listed in The Analytical Scientist as among ten landmark literature papers in the discipline for 2017. "It is a big thrill that this is happening and an honor to be among the other teachers and scholars who have received these awards," Dasgupta said. "They have all left behind a cadre of very successful students, and that is what is most exciting to me. "The Distinguished Texas Scientist Award is particularly special because I've spent all of my professional career in Texas," he added. "I'm also touched that this is an award for a scientist, not a chemist, because while we often like to compartmentalize things, I'm proud that the impact of my work is seen as going beyond the disciplines." Dasgupta, considered a pioneer in the field of ion chromatography, is perhaps most recognized for his work in iodine nutrition. He testified before Congress on the significance of perchlorate in women's breast milk. Perchlorate interferes with iodine uptake and iodine is the single most important element in thyroid hormones, which govern neurodevelopment. Among his lab's active research projects are an environmentally friendly analysis of arsenic in drinking water, the development of a NASA-funded ion chromatograph for testing extraterrestrial soil and the measurement of cyanide in saliva, blood and breath to more rapidly treat cyanide poisoning. Dasgupta says his lab "fosters builders, not users." The first recipient of the Texas Academy of Science's Distinguished Texas Scientist Award in 1979 was Dr. Michael DeBakey, a legendary heart doctor who is widely considered one of the greatest heart surgeons in history. Another recipient was Ilya Prigogine, who also received the Nobel Prize in Chemistry. Dasgupta is only the second UTA researcher to receive the Texas Academy of Science's Distinguished Texas Scientist Award. Jonathan Campbell, professor of herpetology and chair of the Amphibian and Reptile Diversity Research Center at UTA, was named the 2003 Distinguished Texas Scientist. Since its inception in 1979, the award has been given to three times as many biologists as chemists. "Dr. Dasgupta is most deserving of this award, and the recognition is long overdue," Campbell said. "This is an extremely rewarding honor because it not only recognizes his achievements, but it also means his peers in Texas have taken notice of the impact of his work." Dasgupta's father and grandfather were also educators. His family instilled in him a passion for discovery and education, which explains his love of teaching. "Awards are really just a reflection of what my students have done," he said. "To see enlightenment in their eyes – nothing can replace that pleasure. Each and every one of them contributes something unique to my ideas. So, I can't take credit for these awards. In fact, I'm thankful to all of my students because this recognizes what they have done."